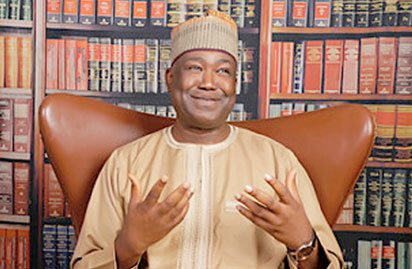 Presidential candidate of Peoples Trust, PT, Mr. Gbenga Olawepo-Hashim has called on the international community to immediately impose sanctions on President Muhammadu Buhari, his aides and their family members over what he described as the violation of due process in the suspension of Justice Walter Onnoghen as Chief Justice of the Federation. “This is very sad, it is condemnable and must be condemned by all lovers of democracy. It is an ominous return to dictatorship and a complete violation of the Constitution of the Federal Republic of Nigeria. “I call on members of the international community to immediately impose sanctions on the members of the executive branch at the federal government. These sanctions should include revocation of existing travel visas for them and their families and business associates including targeted asset seizures. “I call on the president himself to step down and resign because he is leading Nigeria into chaos and anarchy. We fought so hard to install democracy and we paid dearly for it, we will not allow any group of people no matter how powerful they think they have become to take democracy down. This is not about politics, it is about democracy which we fought so hard to put in place in Nigeria. Next Article US House Speaker Pelosi: What does Putin have on Trump?